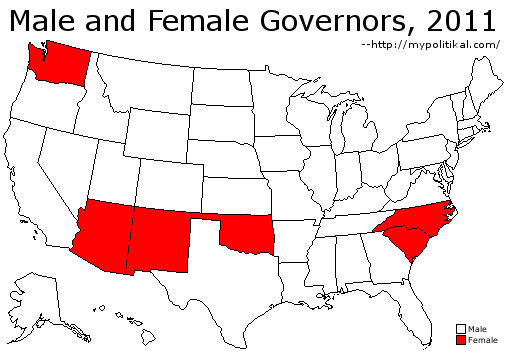 Out of the fifty governors in the United States, 44 are male and 6 are female as of October 8th, 2011. In other words, 88% of governors (about every nine out of ten) in the United States are currently males. Race is a bit more complicated than gender. According to the 2010 Census, 63.7% of Americans are white – which means that 36.3% of Americans are not white. 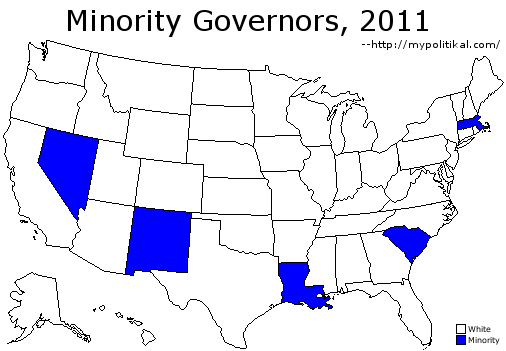 Out of the fifty governors in the United States, 45 are white and 5 are minorities as of October 8th, 2011. Exactly nine out of ten governors in America is white. Out of the fifty governors in the United States, 41 are white males, 4 are white females, 3 are none-white males, and 2 are non-white females as of October 8th, 2011. White males overachieve quite splendidly; despite being less than one-third of the overall population, they compose more than four out of five of America’s governors. 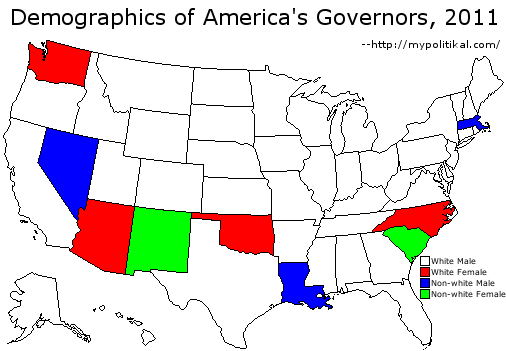 82% of America’s governors are white males. America is a very diverse place. Its governors, on the other hand…not so much. This entry was posted in Asians, Blacks, Democrats, Gender, Hispanics, Republicans, Whites and tagged Democrats, demographics, females, gender, governors, males, minorities, Race, Republicans, states, whites. Bookmark the permalink. In Califirnia both Senstors are Jewish and females. So much for diversity. What about basketball teams? 80% of our legislators are lawyers although lawyers are about 2 million or less than 1 % So where do you want to go with this? I’m proud that both my senators are female; there aren’t enough female politicians in America. I don’t know enough to say whether or not they’re Jewish. What about lawyers? I don’t think it’s a good thing that 80% of our legislators are lawyers. The point is that America’s governors are extremely unrepresentative of America as a whole, to an extent that shocked me.